The Vip Suites is built on the rocky cliff of the picturesque town of Oia, on Santorini, one of the Cycladic islands of Greece. Check-in takes place at the VIP Suites travel agency, located in the bus terminal plaza in the town of Oia. Once the reservation is confirmed, carefully read the procedure established by the VIP Suites. The photographs of the rooms are merely illustrative. There is no guarantee that the assigned room will be the one shown in the photos. 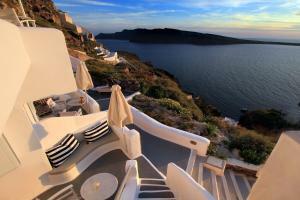 This suite includes a private balcony with views of the caldera and the Aegean Sea. In addition, it has 2 bedrooms, each with 1 double bed, sitting area, fridge, air conditioning, TV and safe. The indicated rate is for 2 guests. The maximum capacity is 5 people (see hotel conditions). 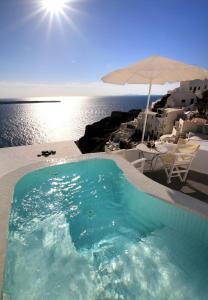 Air-conditioned room with a private balcony overlooking the Aegean Sea. It has a fridge, a safe and a TV. 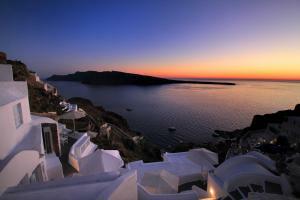 Air-conditioned room with a private balcony overlooking the caldera and the Aegean Sea. It also has a fridge, a safe and a TV. During the stay there may be a change of room. The price includes all taxes and maid service. 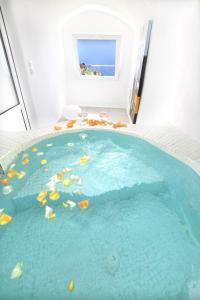 The hot tub is indoors or outdoors.